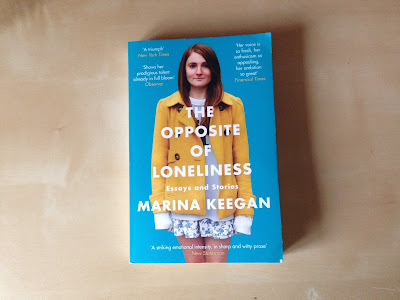 The Opposite of Loneliness is a collection of essays and short stories written by Marina Keegan. Marina, a very promising writer, died in a car crash five days after her graduation from Yale. This book is the result of her teachers, friends and family wanting her voice to be heard despite this tragedy as they collated some of what they felt was her best work and published it. I'll admit. Initially I was interested in this book mainly because of the concept of it. To publish something written by someone who was only 22 years old when she died must mean there is something pretty special about her writing, and there is. Marina's writing is just beautiful and it really is no wonder that the people around her felt it needed to be put out into the world. Her essays were thought-provoking and I was emotionally invested in her stories despite some of them only being a few short pages long. It makes me sad that I will never be able to read more of Marina's writing, but I'm so glad that what already existed was published, despite the tragedy of what happened to her. While the discussion around this book is often concerned with the writer and her personal story, it really should be about her writing. While its difficult to separate the two, Marina's writing is fantastic regardless of the background and the book should be praised because of that, not any external factors. If you're a fan of short stories or essays I would definitely recommend this book. It was an easy read and nice to pick up and read a story now and then. Have you read The Opposite of Loneliness? If so, what did you think? If not, would you like to? Let me know in the comments! It's definitely worth it! Let me know what you think of it if you do get around to it!